Hypothyroidism in pregnancy, both overt and subclinical, affects maternal and perinatal outcomes. Overt hypothyroidism is associated with increased risks of premature birth, low birth weight, pregnancy loss, and lower offspring intelligence quotient. Subclinical hypothyroidism is associated with poor pregnancy outcome. Correct diagnosis and treatment of thyroid dysfunction are important to prevent both maternal and fetal complications. Measurement of thyroid function test is essential for the diagnosis of hypothyroidism. The nonpregnant reference intervals cannot be used in pregnancy for the diagnosis as there are physiological changes in the thyroid function test during pregnancy. Higher level of human chorionic gonadotropin acts on the thyroid-stimulating hormone (TSH) receptor stimulating the production of T4 and T3 which in turn suppress the TSH production by the pituitary. Hence, the TSH levels tend to be lower, especially during the early pregnancy. The increased thyroxin-binding globulin results in increase in the total T3 and T4 levels. In addition, increased urinary iodine excretion and placental expression of Type 2 and Type 3 deiodinases also influence the thyroid function. The reference intervals in thyroid function tests are influenced by age, gender, iodine intake of the population, presence or absence of goiter, size of the thyroid gland, ethnicity, and thyroid antibody status. Apart from this, in pregnancy, the progression through the various trimesters of pregnancies also has a profound influence on the thyroid function tests. Hence, population and trimester-specific reference intervals are necessary. The American Thyroid Association, in their latest guidelines for the management of thyroid disorders in pregnancy, recommends the use of population-based trimester-specific reference ranges for the assessment of thyroid function test in pregnancy. This is a welcome addition to their guidelines and has encouraged researchers to develop trimester-specific reference ranges in pregnant women which is relevant to their population. 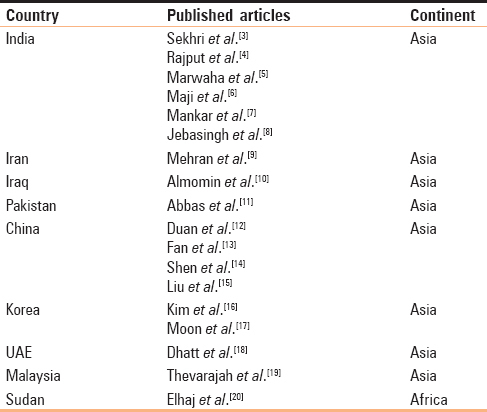 [Table 1] gives a list of countries from Asia and Africa which have trimester-specific reference intervals for thyroid function test derived normal pregnant women from their country or region published in indexed journals. As enlisted in [Table 1], very few studies from Africa have developed trimester-specific reference range for pregnant women. In this edition of “Thyroid Research and Practice,” Sheribaa et al. conducted a cross-sectional study to generate trimester-specific reference range for pregnant women in Egypt. This is the first study of its kind from Egypt. Three-hundred and sixty pregnant women distributed across the first, second, and third trimester underwent thyroid function test. TSH value increased with advancing pregnancy from 1.43 ± 1.16 μIU/mL in the first trimester to 1.64 ± 0.96 μIU/mL in the second trimester to 1.78 ± 1.19 μIU/mL in the third trimester. The strength of the study is its robust exclusion criteria. The different studies for defining trimester-specific range vary in the design (cross-sectional or longitudinal), sample size, statistics, and the assay used. The most important factor is to have robust exclusion criteria so that only normal participants will be included in the study. The findings of the study differ from that of Marwaha et al. It is because of the significant geographic and ethnic diversity in TSH concentrations during pregnancy. This signifies the importance of population-based trimester-specific reference ranges for the assessment of thyroid function test in pregnancy. In a country like India which has a heterogeneous population, reference intervals need to be developed for individual regions of the country. For countries which are more homogeneous in their ethnicity, a single countrywide reference interval may be sufficient if all requisites conditions listed above are fulfilled. This study should be an eye-opener for other countries in Africa to develop their own trimester-specific reference intervals for thyroid function test in pregnancy. There is also lack of data from many other countries in Asia, and more such studies from other Asian countries would be welcome. Maji R, Nath S, Lahiri S, Saha Das M, Bhattacharyya AR, Das HN, et al. Establishment of trimester-specific reference intervals of serum TSH & fT4 in a pregnant Indian population at North Kolkata. Indian J Clin Biochem 2014;29:167-73. Mankar J, Sahasrabuddhe A, Pitale S. Trimester specific ranges for thyroid hormones in normal pregnancy. Thyroid Res Pract 2016;13:106. Available from: http://www.thetrp.net/text.asp?2016/13/3/106/180192. [Last accessed on 2018 May 10]. Jebasingh FK, Salam R, Meetei TL, Singh PT, Singh NN, Prasad L, et al. Reference intervals in evaluation of maternal thyroid function of Manipuri women. Indian J Endocrinol Metab 2016;20:167-70. Mehran L, Amouzegar A, Delshad H, Askari S, Hedayati M, Amirshekari G, et al. Trimester-specific reference ranges for thyroid hormones in Iranian pregnant women. J Thyroid Res 2013;2013:651517. Almomin AMS, Mansour AA, Sharief M. Trimester-specific reference intervals of thyroid function testing in pregnant women from Basrah, Iraq using electrochemiluminescent immunoassay. Diseases 2016;4. pii: E20. Abbas R, Abbas HG, Shahid A, Chand S, Nawaz S. Reference intervals for free T3 and free T4 in Pakistani euthyroid patients: Effect of age and gender on thyroid function. J Coll Physicians Surg Pak 2014;24:806-9. Duan Y, Peng L, Cui Y, Jiang Y. Reference intervals for thyroid function and the negative correlation between FT4 and hbA1c in pregnant women of West China. Clin Lab 2015;61:777-83. Fan JX, Han M, Tao J, Luo J, Song MF, Yang S, et al. Reference intervals for common thyroid function tests, during different stages of pregnancy in Chinese women. Chin Med J (Engl) 2013;126:2710-4. Shen FX, Xie ZW, Lu SM, Aw TC, Zhu B. Gestational thyroid reference intervals in antibody-negative Chinese women. Clin Biochem 2014;47:673-5. Kim HJ, Cho YY, Kim SW, Kim TH, Jang HW, Lee SY, et al. Reference intervals of thyroid hormones during pregnancy in Korea, an iodine-replete area. Korean J Intern Med 2018;33:552-60. Thevarajah M, Chew YY, Lim SC, Sabir N, Sickan J. Determination of trimester specific reference intervals for thyroid hormones during pregnancy in Malaysian women. Malays J Pathol 2009;31:23-7. Elhaj ET, Adam I, Ahmed MA, Lutfi MF. Trimester-specific thyroid hormone reference ranges in Sudanese women. BMC Physiol 2016;16:5. Sheriba NA, Ibrahim NA, Mohamed NR, Hegab AM. Assessment of normal range of thyroid function tests in healthy Egyptian pregnant women. Thyroid Res Pract 2018;15:70-4.